Howard “Jack” Aleff and Reena Slominski, of Knoxville, have been found guilty of receiving $303,890 in wool loans for unsheared sheep. The problem is that the sheep were not only not sheared, they did not exist. The couple told the government that they had the sheep in 132 fraudulent applications for loans for their company L & J Wool & Fur. The scam last for six years and the couple was told to pay the United States $1,376,670 in a civil judgment. They previously pled guilty to the criminal charge of Conspiracy to Defraud the United States and were sentenced to five years’ probation, fined $60,000, and ordered to pay restitution of $303,890 to the Commodity Credit Corporation. In 1947, the government began subsidizing wool and mohair production. Loan Deficiency Payments in the United States totaled $30.7 billion from 1995-2012. 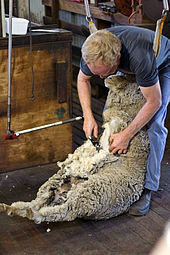 In 1993, Congress voted to end subsidies for wool and mohair but different financial support programs continue. eligible crop to store the production and pledge the crop itself as collateral. The loan proceeds help the producer pay bills when they come due without having to sell the harvested crop at the time of year when prices tend to be lowest. Later, when market conditions may be more favorable, a producer can sell the crop and repay the loan. Loan proceeds are based on loan rates set by statute and the quantity of eligible commodity pledged. Marketing assistance loans for each eligible commodity (wheat, corn, grain sorghum, barley, oats, upland cotton, extra long staple cotton, rice soybeans, other oilseeds, dry peas, lentils, small chickpeas, honey, wool, mohair) are nonrecourse in nature. That is, a producer has the option of delivering to the CCC the quantity of a commodity pledged as collateral for a loan as full payment for that loan at loan maturity. In order to discourage forfeiture to the CCC, market loan repayment provisions specify that, under certain circumstances, a producer may repay less than the original loan principal and accrued interest and other charges, thus receiving a “marketing gain” equivalent to the waived portion of the debt. Alternatively, loan deficiency payment (LDP) provisions specify that, in lieu of securing a loan from CCC, a producer is eligible for an LDP that equals the marketing gain, if any. I admittedly have a “Chicago school” tendency toward some issues on the free market (a bias acquired at Chicago as an undergraduate). However, I fail to see the true public value in such subsidies and even some subprime loan programs. These payments and loans amount to a great deal of federal money but not enough to make a significant difference in the supply of wool or mole hair. This is now a global market that is controlled international shifts in supply and demand. It is a good thing that the Solminiski will not be fleecing the government any further but there is a larger question of the true value of these programs. How much has the oil industry been subsidized during this same time period? If you don’t fleece the government big to the sound of trumpets, like Oil-Qaeda and the banks, you get punished. Senator Proxmire is smiling @ his student. Too bad the fed couldn’t come up with one criminal charge for HSBC banksters who were money laundering for Iran and drug cartels. Too bad that the fed couldn’t come up with any charges for any bankster and their voluminous mortgage crimes. Got the sheep shearer gang though…. People see banksters, the connected and the wealthy receive tax laws written for their benefit, they are bailed-out of financial disasters of their own creation, they party with ALEC and receive favorable treatment, they are above the law since they serve no time for their crimes. So it’s not surprising to see these sheep shearing scams, since it’s what is expected. It’s how America gets by. Scam or be scammed. Yeah…. This is how the Free Market works….. I am all in favor of such programs, especially since the Feds have done nothing to stop the rampant speculation that artificially inflates prices and depresses them at various times to the advantage of the speculators. The program keeps the growers from being fleeced. We have a railroad commission in Texas because the railroads were charging high prices to ship the commodities and screwing the farmers, so that the railroads made all the money and the farmers made none. Agriculture is not like a factory that can start and stop production lines at will. Food is a vital necessity for ALL of us. It takes months, and in some cases years to grow it. So it is in the interest of society to ensure a long term supply of food and to take speculation out of the process by any means. Unless of course, we wish to go back to the “good ol” days when we let millions starve while food was being withheld to drive the prices up.